The Panasonic AW-UE70KPJ professional video industry’s first integrated 4K PTZ camera, the Panasonic AW-UE70KPJ is your key to best-in-class pan/tilt/zoom 4K IP streaming and in-camera 4K recording. It delivers 3840 x 2160 resolution images at 29.97p/25p via HDMI, and is capable of doing it via IP streaming or in-camera. Featuring key production orientated features such as genlock, Optical Image Stabilization (O.I.S) and remote switchable ND filters. The camera’s flexible 4k/HD capabilities make it a good choice for demanding installations in stadiums, conference rooms, lobbies, auditoriums and retail, where ultra-high resolution video and the best in precise control are required. The Panasonic AW-UE70KPJ, with 3G-SDI as well as HDMI video outputs, incorporates a 1/2.3″-type MOS sensor and advanced processing. The camera boasts direct-from-camera audio/video streaming up to 2160/30p. The camera’s IP streaming – in combination with the Panasonic AW-UE70KPJ’s standard IP-control, built-in audio input and PoE (power over LAN cable) capabilities – enables innovative “single-cable” remote production applications. Additionally, the UE70 functions as a USB webcam for videoconferencing and collaboration-with a 20X zoom lens, preset functions, wide field of view (65.1 degrees) as well as simultaneous IP and USB streaming and control. The Panasonic AW-UE70KPJ offers in-camera video and audio recording to a microSD card at 2160/29.7p or 1080/59.94p, which can be utilized for event capture or back-up. Recorded files can be delivered via networking, simplifying workflow and reducing peak network load. Because it is USB-Video enabled, the UE70 also presents a premium choice for PC-based videoconferencing and collaboration. It also features stereo MIC/LINE-level switchable audio input for embedding. Embedded audio may be used in conjunction with HDMI, 3G-SDI, streaming and recording functions. 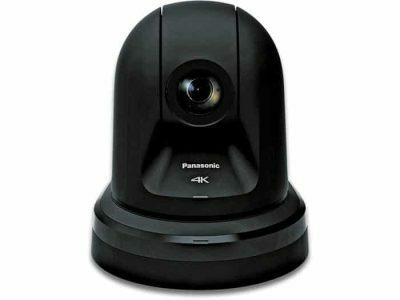 The camera incorporates the versatile IP/Serial/Web control system and IP-Live Preview pioneered in Panasonic’s AW-HE60, HE130, and HE40 series cameras. IP, RS-422, RS-232C in/out interfaces are included, and a built-in Web-server enables both browser control and IP-live preview and setup from PCs, Macs and mobile devices including iPhone, iPad, and Android and Toughpad devices. RS-422 Serial or IP control is available using Panasonic’s AW-RP50N, AW-RP120G controllers, AK-HRP200G paintbox and the AW-HEA10 system, as well as appropriately programmed systems from Crestron, AMX, Winnov, and other manufacturers. The Panasonic AW-UE70KPJ includes many powerful features that expand the capabilities of professional video system users. In addition to Panasonic’s Dynamic Range Stretch (DRS) and advanced Digital Noise Reduction (DNR), an ingenious High Dynamic Range (HDR) mode helps produce very good video even in extreme contrast and lighting conditions. For shooting in virtually total darkness, the Panasonic AW-UE70KPJ’s Night Mode makes it possible to automatically switch to the capture of high-quality, HD monochrome video with the use of an (optional) IR illuminator in the 850nm range, making the camera ideal for reality show production, sleep lab research and staging support. A Freeze-During-Preset function can be enabled to store and display a video still-frame during preset recall and camera movement to improve the viewer experience during rapid on-air moves or in single camera use. With POE , full IP remote control, and IP-live preview, the UE70 affords simpler integration, easier remote production and engineering, and lower cost for multiple location systems. Multi-view monitoring of up to 16 cameras in a single Browser window is available (in M-JPEG mode only). The Panasonic AW-UE70KPJ incorporates a highly-accurate pan-tilt head (with a pan of ±175° and a tilt of -30° to 90°) that offers precise, fast, fluid movement in all directions, enabling the capture of both slow and fast-moving objects without excessive vibration and bounce. In addition to 4K 2160/29.97p/25p, the camera delivers many international HD signal formats including: 1080/59.94p/50p, 1080/59.94i/50i, 1080/29.97p/25p, 1080/29.97PsF/25PsF and 720/59.94p/50p. Other key features include direct color temperature adjustment, three-step gamma correction, and seven-step chroma level adjustment for exceptional creative control. Up to 100 pre-set memories for rapid and precise shot recall, an electronic shutter with synchro scan, and built-in tally light for remote studio use are also provided. The camera’s included ceiling mount attaches with a simple turn-lock mounting mechanism to facilitate quick and easy installation. The Panasonic AW-UE70KPJ series cameras can also be used with Panasonic’s cost-effective optional outdoor housings.